Though onion roofs are most commonly associated with the great cathedrals of Europe, there’s no reason why they can’t make a bold addition to a home or commercial property anywhere in the world. As their name implies, they feature a tapered, rounded shape much like an onion. Made from handcrafted and steam-bent wood shingles, onion roofs can be made in a variety of sizes and configurations to suit any design requirement. A great example of the versatility of an onion-style roof can be seen in the Chapel of Roses, a restoration project recently completed by the Custom Shingles team. 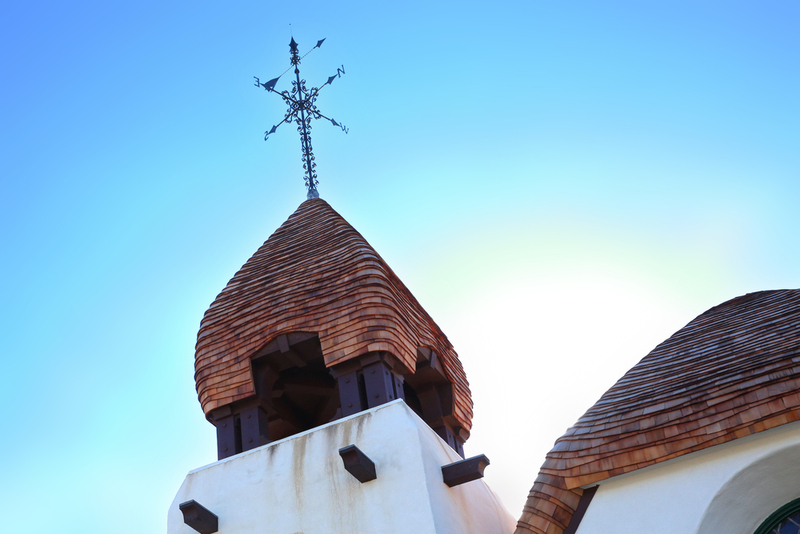 Here, a wooden shingle onion dome forms the dramatic pinnacle of the building’s bell tower. For this project, great care was taken to maintain fidelity to the chapel’s original design. The end result is something truly spectacular and unique. Custom Shingles can design and install an onion-style roof for any property. We manufacture custom curved shingles from cedar, teak and Royalwood™ Wallaba, as well as synthetic materials. If you have an existing home or structure you would like restored or repaired, we can in most cases provide a preliminary quote for you with just an address and a couple of photos. We also offer onion roofs for new buildings and other projects. Contact our office directly to learn how we can help you. Onion roofs are just one of the many architectural features we can design and install. We believe in working closely with our clients to help them realize their creative vision. We can build an onion roof around the windows, dormers, vents and other features of your home, suggesting improvements that complement and enhance its architectural style. To ensure our work is around for your long-term enjoyment, we use only high-quality materials and workmanship. Our wooden shingles are bent and shaped by hand to ensure the best fit possible, and can be treated to provide superior resistance to the elements. In short, we can manage any and all of your requirements, whether you need a renovation of an existing roof, a historical restoration for an older property or a brand-new installation. Our design flexibility and custom manufacturing expertise allow us to seamlessly incorporate an onion roof, rolled eave or practically any other architectural feature with an exceptional level of craftsmanship.